I often wonder why it is science-fiction films from the 1970’s are able to strike such a cord of eeriness with me. Perhaps it’s a connection to vague childhood memories, or perhaps it’s the proliferation of experimental styles from the 1960’s mixed with primitive electronic instruments. There’s almost always a note of desolation and a deep rooted pessimism produced from a decade that felt on the brink of environmental and social collapse, and at the same time, there is the dying embers of hippie free love and peace that would soon to give way to the hedonism and excess of the disco era. It was a very weird time to be alive, even if you were only 4 or 5 years old, and it produced some very strange SF films. An unspecified cosmic event has altered Earth’s ant population, giving them a rapidly increasing intelligence, along with a more aggressive nature. Ernest Hubbs (Nigel Davenport) and his assistant, James Lesko (Michael Murphy) set out to research the ants and the strange formations they are building in the desert. They secure themselves in a fortified dome in the center of the ant activity in order to study them. James rescues a young girl, Kendra (Lynne Frederick) from a nearby farmhouse. Hubbs looks for a way to destroy the ants, but it isn’t long before he learns they are under siege by an enemy that’s more intelligent and better organized. First and foremost, it’s a beautiful looking film. Ken Middleham's macro photography of the ants is stunning work, especially a long sequence of them contracting and become resilient to a toxin engineered by Hubbs. It’s short entirely without narration, relying only on the actions of the ants to communicate what is happening and it works wonderfully. Bass puts together some wonderful screen compositions, the geometric ant towers are strange and foreboding against the empty landscape of the desert. It's a shame he didn't direct more films. The human element of the film isn’t quite as effective. This is the problem with keeping things so reserved, you never really get a grasp on their characters. Only Hubbs really stands out, but when you’re psychotically trying to destroy something no matter what the cost, you’re going to get noticed. The electronic score is suitably unnerving and minimal. It serves well to punctuate the hapless people who are facing the unknown. The ending of the film was truncated by the studio and it does feel extremely abrupt and cryptic. Recently, the complete ending of the film was discovered at the Academy Film Archive. It only slightly illuminates what’s happening at the end, but the pace feels much more in line with the rest of the movie. It was re-edited back in and screened at the Alamo Drafthouse in early 2012, here’s hoping a Blu-Ray release isn’t too far away. 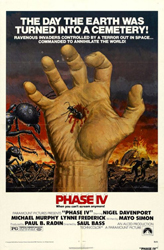 Phase IV is a quiet, thoughtful piece of science-fiction film making that builds upon a growing dread before becoming horrific and then transmogrifying into something almost New Age. Despite what the poster would have you believe, the actual film is miles away from a typical “nature gone amok” eco-horror story. It’s a strange movie for a strange decade.